Winter is still here with beautiful, clear skies which generally bring cooler temperatures. I had decided to not try and commute with the BMW until the temperatures warm up a bit. It was hard to start and there were some flaky electrical issues yesterday while riding around at -38°F. I figured that since today was colder, I wouldn't tempt fate. The electrical problems were things like a blown tail light fuse but couldn't identify why, the headlight not turning on when I headed home yesterday, and it would take numerous attempts to get the bike to turn on with the key. I'll chalk all that up to the cold and a 33 year old bike. 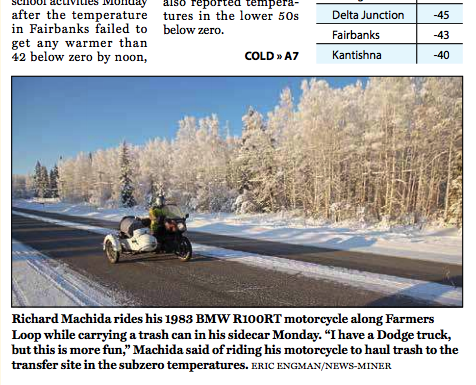 At least in this little world called Fairbanks, I made the front page (below the fold). On Monday afternoon while test riding the BMW/Cozy sidecar rig, a local newpaper photographer caught up with me while I was hauling trash. He asked me a few questions and took a photo after I had emptied the trash barrel. He had a hard time believing that I was out riding just to haul trash. Here is the link to the pdf of the front page of that issue of the local paper. I'm not sure how long they keep these online. You are Ironman! I feel like a complete wimp! I bow down in Moto humbleness. The main reason I got into sidecars was for winter riding. I knew you would get some attention as "There's that guy again". I've never seen anyplace with so much heavy frost and so often! Even I would not be able to stay indoors with scenery like this waiting out there. Absolutely beautiful. And yes, very Zhivago. He mentioned that he's seem me around before on a different bike but stopping was never convenient. I really like sunny days with all of the frost on the trees too. Hopefully, that article will get picked up and spread far and wide by other news outlets! Congrats! Presently awaiting replacement lifters for the URAL? That is a cool way to get famous! Don't think I would ride in those temps. Clever. I didn't plan on riding at these temps either. Kind of like a frog in a heating pot. The temperature changes slow enough so you don't really notice. It's about time, Richard, that your effort is getting noticed. This is my absolute favourite video by the way, even if it is just "taking out the trash". I really like riding through the frosty, sun lit trees. "Getting noticed" was never the goal. Congrats on the write up! Very cool! Apologies if this posts twice. I'm having blogger issues. So now I have a reputation to maintain, eh?